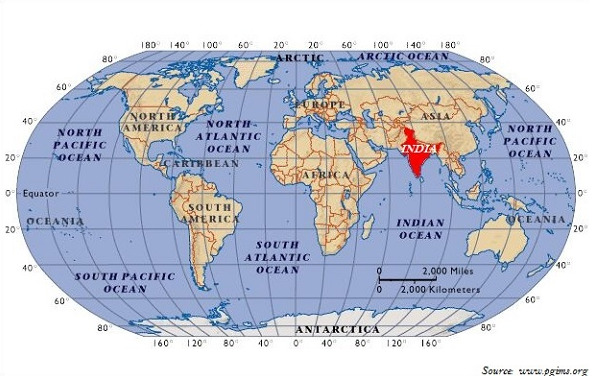 India is located entirely in the northern hemisphere; specifically in the south-central part of the continent of Asia. 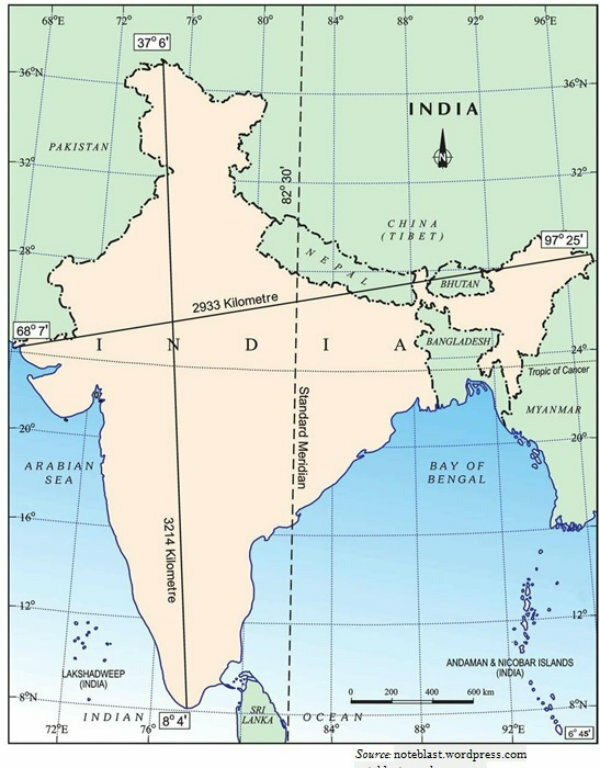 The mainland of India extends between latitudes 8∘4′N8∘4′N and 37∘6′N37∘6′N and longitudes 68∘7′E68∘7′E and 97∘25′E97∘25′E (as shown in the map given below). The southern boundary extends up to 6∘45′N6∘45′N latitude in the Bay of Bengal. With an area of 3.28 million square km, India is the 7th7th largest country of the world. The six largest countries of the world in decreasing order are Russia, Canada, USA, China, Brazil, and Australia. India accounts for about 2.4 percent of the total geographical area of the world. India has a total land boundary of about 15,200 km. The coastline of India stretches along the Bay of Bengal in the east and the Arabian Sea in the west (as shown in the map given above). From Gujarat (westernmost) to Arunachal Pradesh (easternmost), there is about 30∘30∘ difference; hence, because of this difference, there is a time difference of two hours between Gujarat and Arunachal Pradesh. The sun rises in Arunachal Pradesh about two hours earlier as compared to Jaisalmer in Rajasthan. The maximum length of the mainland from north to south is about 3214 km. The maximum length of the mainland from east to west is about 2933 km. India’s total length of coastline is 6,100 km of its mainland and after including Andaman and Nicobar, and Lakshadweep islands, it is about 7,516 km. India’s territorial limit further extends towards the sea up to 12 nautical miles (i.e. about 21.9 km) from the coast. 82∘30′E82∘30′E Meridian crossing through the Mirzapur city of Uttar Pradesh is taken as India’s Standard Meridian. Indian Standard Time is ahead of Greenwich (0∘0∘ or Prime Meridian) Mean Time by 5 hours and 30 minutes. Tropic of cancer (23∘30′N23∘30′N) passes through Gujarat, Madhya Pradesh, Chhattisgarh, Jharkhand, West Bengal, Tripura, and Mizoram. The difference in latitudinal extent influences the duration of day and night. India has total 29 States, 6 Union Territories, and 1 National Capital Territory. India is bounded by young fold mountains (the Great Himalaya) in the North and North-East. Throughout the history, India’s connections with other parts of the world has been heavily influenced by waterways and also the mountain passes. India shares its international boundaries with Afghanistan and Pakistan in the North-West; China, Tibet (China), Nepal, and Bhutan in the North and NorthEast; and Myanmar and Bangladesh in the East. Island countries Sri Lanka and Maldives are India’s neighbors across the sea. Sri Lanka is an island nation located off the southern coast of India in South Asia and it is bordered by the Indian Ocean. 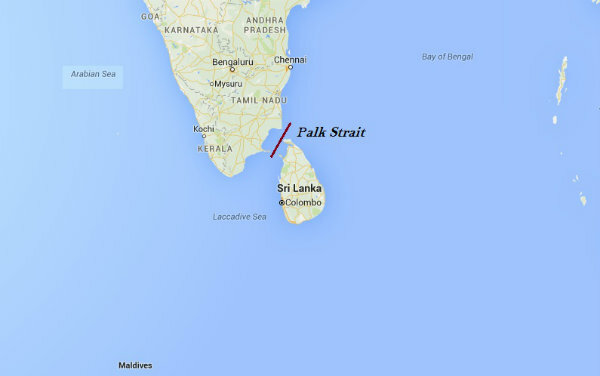 India and Sri Lanka are separated by a thin water body called the Palk Strait. Maldives is a chain of islands located south-west of Sri Lanka and India in the Indian Ocean.